It's not every day that a stranger sends you a package of treasures. 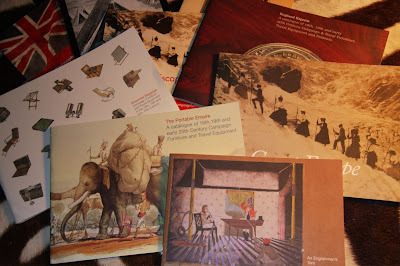 In a wildly generous, glorious move, reader Pam Foster was kind enough to dispatch me a little bundle of joy - catalogues that catalogue almost everything I find beautiful. It's a treat beyond compare. She and her husband recently returned from the Cotswolds where they visited two of what must be the world's greatest shops - Christopher Clarke Antiques and Manfred Schotten Antiques. Mr. Clarke specializes in campaign furniture, while Mr. Schotten likes to focus on sport. Both are equally amazing. These are some of the covers of the Christopher Clarke catalogues, including The Great Escape, a a now-passed charity sale, for which both shops teamed up to sell a bunch of items celebrating those who paid no heed to boundaries. (Pam -- thank you so much. It's all just too cool!). Perhaps a post of some of the campaign furniture from the catalog? I can't get enough of it. I'm even considering erecting a tent in the back yard and moving some pieces out there to live in for a little while. What an incredibly delightful thing for a follower of your blog to do. Kindness and generosity prevail in this world. Plus, selfishly it gives us other readers equal joy. Thank you both. What a great haul. Christopher Clarke has the best furniture. Lucky girl, lucky girl! The images alone are delicious. Very much enjoying your blog and your aesthetic.